Will I be notified about network improvements? This article will take you through steps you can take to improve the performance of your Wi-Fi. The Wi-Fi connection can affect the speed you receive and the stability of your connection (i.e if it briefly loses its connection frequently). What affects Wi-Fi speeds & connection stability? There are many things you can do to improve the signal of your Wi-Fi, and its speeds. Does your modem match your needs? Devices will always get a better signal and speed the closer they are to your modem. If you use devices all across your home, it could be better to locate your modem in a central point. It's always better to raise your modem off the ground where possible, as floor materials can interfere with signals, and therefore speeds. Electrical appliances that are turned on can cause interference that negatively impacts Wi-Fi signals. Anything from microwaves, driers or lamps, if close to your device or modem, can cause interference. You might consider turning off these devices when you are using Wi-Fi. There are various Wi-Fi analyser applications for devices that can show which frequency band or type of appliance is causing interference. You have 2 networks that you can choose from when using Wi-Fi (2.4Ghz & 5Ghz). The 2.4Ghz channel is best used when devices are further away from the modem - a much greater distance is covered by the signal. The 5Ghz channel has a stronger signal closer to the modem. If you normally use devices close to your modem, the 5Ghz network may improve your speeds over Wi-Fi. The number of connected devices simultaneously using the internet will affect the amount of download speed each can achieve (e.g. 10 devices connected on a service receiving 80Mbps download speed, will have ~8Mbps each). If you have a MyRepublic Wi-Fi Hub +, we recommend not connecting more than 10 devices at the same time, as this will reduce available speeds. If you have a Halo modem, we recommend not connecting more than 20 devices at the same time, as this will reduce available speeds. If you are using a modem of your own, please check the manufacturer's specifications to determine the recommended amount of devices that can be connected at the same time. Here's how to upgrade to the Halo modem. If you live in a large, multi-story home, have a big family, or like to connect a lot of devices at the same time, the Halo might be for you. You can see its benefits here, or upgrade here. If you're in a high-density location, like an apartment complex, there can be interference from other modems and devices close to you that can affect your speeds. 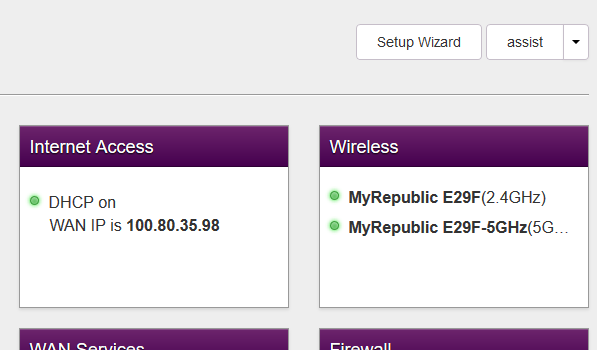 Note: These instructions are for The MyRepublic Wifi Hub+ and MyRepublic Halo modem. For instructions on changing WiFi channels on an alternative modem, check the manufacturer's website. 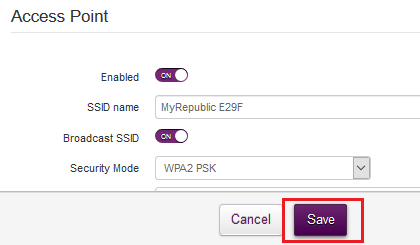 You can change the Wi-Fi channel to reduce that interference. Log in with the default username; admin, and default password; admin. If you have changed these settings from the default, use your custom details instead. Click the Wireless panel on the dashboard. Scroll down to 'channel'. We recommend trying channel 6 or 11 initially, as these often yield the best results. Try changing the channel and running a speed test via Wi-Fi - you can experiment to see which channel gives the best results. 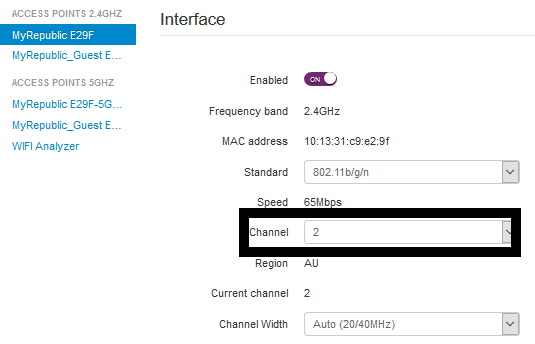 You can also use your MyRepublic modem's built-in analyser to see which channels have the least interference. If the above steps don't fix your problem, we'll need to investigate further. You can jump on our Live Chat (or send us a message if we're not there! ), and one of our team will continue the investigation.